Okay, admit it, you’re in a rut. It’s the same old, same old every day and you’re not sure how to break out. Welcome to Life 102 where routine is what gets you through the day (Life 101 began when you were born). Whether it’s the daily grind of work or home, we often forget that we have the ability to make small changes that will get us out of our temporary ruts. 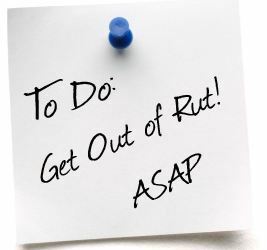 With the small ruts, the ones where routine bores us but doesn’t grind us down to the bone, we can always take a day off, go for a walk, and meet a friend for lunch or any number of activities that will take us out of our immediate mindset and refresh our energy. But what about the life-numbing chasms we fall into like a dead end job with a toxic boss or a relationship going nowhere? As we’ve discussed on this blog, life is about mindsets: what you see is what you think and what you think is probably what will happen. So let’s say, you’re in that dead end job and you come home every night in a worn out, aggravated and unresponsive mood to the world around you. If you think you’re stuck, you’re right. But if the dissonance in your life is so strong that the only way up is out, well, you’ve just started to get out of your rut. You’re making a choice to change and you will get what you’re ready for. We often hear people say they’d leave their jobs but the money is good or the benefits are or the economy is bad and now is not a good time or the retirement package is terrific—and they slowly die of mental silicosis. Excuses, excuses, excuses. We’ve all got them. For the simple ruts, a quick refreshing pause is usually enough to get back on track. And sometimes being bored is good because you can’t be “on” all the time and you need some time to decompress to appreciate what you do have. For the big stuff like a new career and job or a nowhere relationship ask yourself: “Where do I want to be in another year?” And what are you prepared to do to get there? Go back to school or get extra training or get the resume shined up or network like crazy, go to counseling or get a divorce or move out, what will get you moving in the right direction? Regardless of what you do, you’ll still be a year older. Will it be easy? Maybe easier than you think or maybe it will be a roller coaster and you’re in the lead car and hanging on for dear life. We’re reminded of a saying from the siege of Sarajevo during the Bosnian conflict in the 1990s where people were making life and death decisions of either staying or leaving for safer climes: “The highest mountain is your own doorstep.” Your rut probably doesn’t compare to a war although it may seem like it at times, but the message is clear; you have the keys to the door and the choice is yours. And the mountain is there. What are you waiting for?